Today started off pretty well actually. There were thunderstorms moving in and the forecast was rain all day which is just how I like it. The first thunderstorm was particularly loud and windy, and I was enjoying it even if Zephyr was not. She kept whining and shivering, staring up at me as if to say “Make it stop please?” I’m flattered that she thinks I’m an all-powerful being who magically produces food and treats every day, but my powers do not include controlling the weather. The power was flickering for a bit, which was mildly annoying but nothing I couldn’t handle. The internet died so I decided to vacuum in the meantime and if it wasn’t back by the time I finished, I’d just have to play single player games instead of co-op games with Lord Crumb. Then the power went off and stayed off. With nothing better to do, I grabbed a random book my mom had bought me at a garage sale and started reading while the storm raged on. That’s what I used to do back when I lived in the country and we lost power to a storm. I was hoping that the outage wouldn’t last too long because I really wanted to play some games today. It didn’t help that the book wasn’t very good. Somehow it was a “New York Times Bestseller” yet it felt like it was written by a high school girl. There was a lot of flowery language revolving around the guy the protagonist had the hots on, and just how perfect he looked. Support characters were little better than cardboard cutouts without much reason to be involved in anything and only there to give the main characters some flunkies. People who have magic powers are of course super beautiful as well. Characters didn’t react realistically to the deaths of other characters, even their parents. At one point a main character dies horribly and all I could think was “well that was a stupid death”. I pretty much had no empathy for any of them. Eventually I got hungry and had to search for food outside the house since I couldn’t cook or microwave anything. The grocery store just a few blocks away had power and as I was driving back, I noticed that houses just a block away had power. But still nothing at home. I read some more of the crappy book because I was bored and once I start a story or movie, I like to finish it. A perfect example of this is how years ago, my friend wanted to watch Sleepless in Seattle at a sleepover. It wasn’t my cup of tea but I went along with it anyways. Half an hour later she was asleep but I still watched the movie to the end even though it was really late. I tried playing Fallout Shelter on my phone but gave up after I realized it was the “click stuff and then wait 5 minutes” kind of game. Plus I was the only one in the house whose phone wasn’t dead so I needed to save the battery in case of an emergency. Back to the book then. I ended up reading the whole thing. Eventually my brother suggested a board game. I’m usually not too keen on board games so I was reluctant, but I finally agreed to try it. It had to be better than the book. 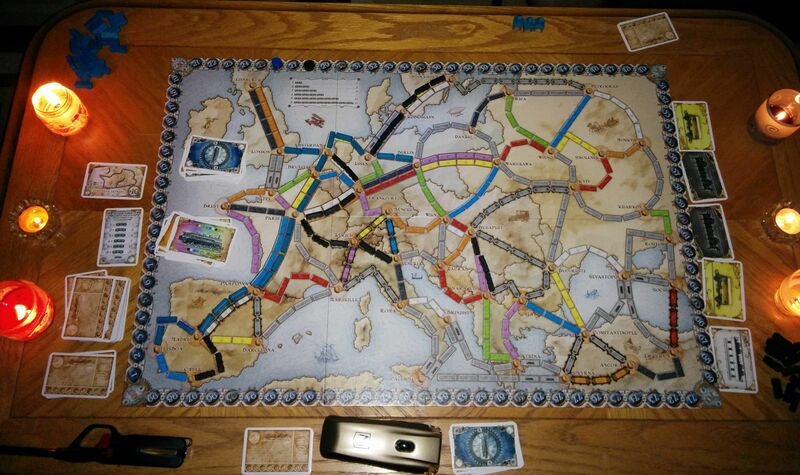 He pulled out Ticket to Ride: Europe which I had never played before and he had only played on PC. It took a while to set up and learn the rules, especially since it was getting dark and I had to get out some candles so we could see something. We still had to use hand-cranked flashlights a lot. I don’t know how people managed to do much just by candlelight. It was actually kind of fun. It wasn’t very complex like some of the other board games people have tried to get me to play. Kind of like the card game Munchkin where even beginners can pick it up fairly quickly. The power finally came back on while we were still playing, over 9 hours after it had gone off. We opted to finish the game and while I was in the lead for a while (I played black), my brother still beat me. I’d be up for playing it again in the future though. Just not when video games are available. Ticket to Ride is one of my favorites. It’s simple but engaging!